E. Dakota: Cultural Mondays with a Little Toe Tappin Fun. Cultural Mondays with a Little Toe Tappin Fun. The blessing of New York culture is also the curse. There is so much going on at all times that I'm often plagued with guilt that I'm not immersing myself enough. I won't tell you how long its been since I've been to one of our amazing museums because it's embarrassing. Lately though I've been one lucky girl, and have had friends inviting me along for great experiences left and right. So last Wednesday when a friend asked if I had plans that Friday I was more than excited to accept an invitation to see a Bluegrass band at Carnegie Hall. The Punch Brothers not only lived up to my excitement but far exceeded it. Before a note was played, the visual of these 5 guys was fantastic; two in full suits, three in mismatched suit pants and vests, a fohawk, violet wool pants... And this was all before the instruments! Two old school radio looking microphones, a mandolin, a guitar, a bass, a banjo, and a fiddle. It was the perfect marriage of quirky hipster southern style, a plethora of string instruments, and sheer artistic sense. It was like they were all so clever and creative each element fell right into place. My mind was racing with things I wanted to write down about this visual smack in the center of this elegent white stage with delicate gold trim where the World's most prestigous perform. The crowd was fantastic as well. It was composed of all types. From long haired hipsters who called their Bach cover "off the hook," behind us, to the stiff looking portly man to my right, with a thick mustache and a pudgy little wife who grabbed his hand in the middle of the show--he held on for the rest. I could go on and on about what a phenomonal experience it was sitting in Carnegie Hall watching and listening. I could also probably research their accomplishments for hours on end, both individually and as a group. 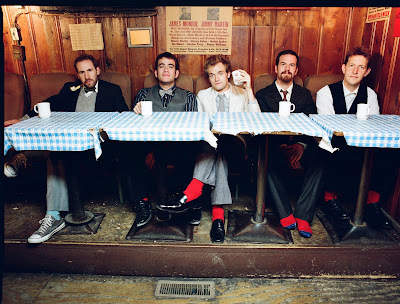 But check them out for yourself -- The Punch Brothers playing "Sometimes".